Stephen F. Austin State University ranks as one of the top 50 universities in the nation for its Bachelor of Business Administration in economics, according to Best College Reviews. SFA was in the top five Texas institutions listed and 29 in the nation. NACOGDOCHES, Texas - Stephen F. Austin State University ranks as one of the top 50 universities in the nation for its Bachelor of Business Administration in economics, according to Best College Reviews. An organization dedicated to helping students discover the best college for them, Best College Reviews utilizes college rankings, reviews, blogs and informational graphics to educate potential students. 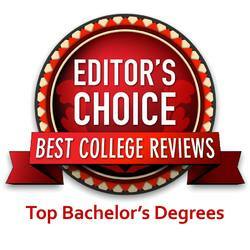 Best College Reviews considered more than 250 accredited schools to discover the best bachelor's degree programs in business economics. SFA was in the top five Texas institutions listed and 29 in the nation. Best College Reviews considered tuition, data from the U.S. News & World Report, and program information in determining the rankings. SFA students can receive either a Bachelor of Business Administration in economics, which is a business degree and shares foundational courses with other business majors in the Rusche College of Business, or a Bachelor of Arts in economics, which is a liberal arts degree better suited for those not pursuing business. "Our business economics program provides students with a solid foundation of a business curriculum and challenging coursework in economics," said Dr. Mikhail Kouliavtsev, chair of the Rusche College of Business' Department of Economics and Finance. "Students graduating with this major are equally well prepared for careers in industry or the public sector, as well as advanced study in economics, business, data analytics or law." Recent SFA economics graduates have been successful in the workplace, securing employment at companies such as Alliantgroup, Fidelity Investments, TD Ameritrade and Lockheed Martin, and many have been accepted into prestigious graduate programs across the nation. Kouliavtsev credits much of the program's success to the faculty members in the Department of Economics and Finance. "Our economics majors benefit from having faculty members who are involved in their students' education beyond the classroom," Kouliavtsev said. "Faculty members work on undergraduate research projects, supervise internship experiences, organize field trips to conferences and actively participate in student-run organizations." To learn more about this program, visit sfasu.edu/ecofin.